eDAQ EChem software is designed for the collection, display and analysis of data from electroanalytical voltammetric experiments. See the EChem Startup System a complete system with software, data recording unit, potentiostat and electrodes, which is ideal for those wanting to include voltammetric experiments in their undergraduate course, or for researchers who want a system for cyclic voltammetry. With an e-corder system EChem software is fully compatible with the modular EA163 Potentiostat, high sensitivity EA362 Dual Picostat and four-channel EA164 QuadStat. EChem can also be used with the ER466 Integrated Potentiostat. EChem uses the e-corder recording systems as the digital waveform generator, and data acquisition system. Thus even non-scanning potentiostats can be upgraded to the full range of EChem techniques. The potentiostat should have an 'external input' and current and potential recorder outputs. Most analog potentiostats are suitable. EChem version 2 has improved resolution (16 bit sampling, with 32 bit floating point averaging), and faster scan rates (to about 100 V/s) than earlier versions. All voltammetric techniques are also supported in stripping mode. EChem also features the Multi Pulse Voltammetry technique to design your own potential waveform using a staircase ramp and up to two pulses per step. Experiment with new techniques such as Cyclic Square Wave Voltammetry. 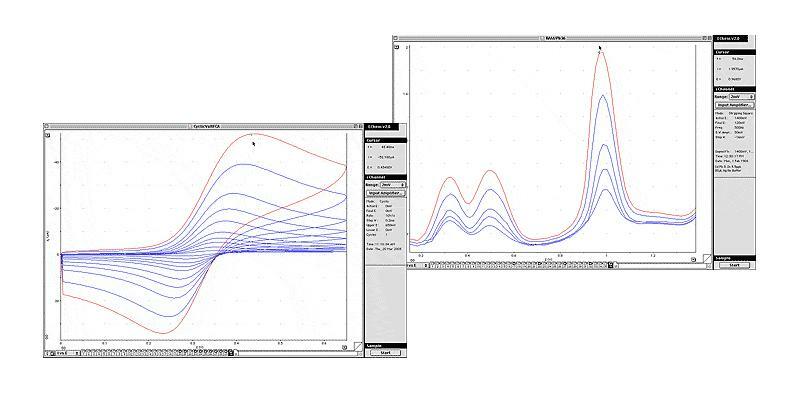 For the full list of electrochemical techniques supported by EChem and Chart, see the Software for Electrochemistry Techniques application note. You can export raw or smoothed voltammograms (as graphics or tabular data) to other graphing software, word processors, and spreadsheets. Smooth, differentiate or integrate signals; the raw signal is always maintained. Reassign the zero point of the potential axis of a voltammogram to show data relative to a different reference electrode. EChem gives the highest quality data possible from your potentiostat. EChem averages the current signal over a 'sampling period' for each data point gathered. The signal-to-noise ratio of a signal is improved by a factor of the square root of 'n' when 'n' readings are averaged. Utilising gallium for enhanced electrochemical copper analysis at the bismuth film electrode. Chad Prior, Claire E. Lenehan, and G. Stewart Walker. Analytica Chimica Acta, 598, 65-73, 2007. Single-walled carbon nanotube/trititanate nanotube composite fibers. Chonlada Dechakiatkrai, Carol Lynam, Kerry J. Gilmore, Jun Chen, Sukon Phanichphant, Dmitry V. Bavykin, Frank C. Walsh, and Gordon G. Wallace. Advanced Engineering Materials, 11, B55-B60, 2009. Structural Characterization of Zinc and Iron (II/III) Complexes of a Porphyrin Bearing Two Built-in Nitrogen Bases. An Example of High-Spin Diaqua-Iron(III) Bromo Complex. Ismail Hijazi, Thierry Roisnel, Pascale Even-Hernandez, Florence Geneste, Olivier Cador, Thierry Guizouarn and Bernard Boitrel. Inorganic Chemistry, 49, 7536–7544, 2010. Novel neural interface for implant electrodes: improving electroactivity of polypyrrole through MWNT incorporation. R. A. Green, C. M. Williams, N. H. Lovell and L. A. Poole-Warren. Journal of Materials Science: Materials in Medicine, 19, 1625-1629, 2008. Application of Anodic Stripping Voltammetry for Zinc, Copper, and Cadmium Quantification in the Aqueous Humor: Implications of Pseudoexfoliation Syndrome. Vassiliki S. Panteli, Dimitra G. Kanellopoulou, Sotirios P. Gartaganis and Petros G. Koutsoukos. Biological Trace Element Research, 132, 9-18, 2009. Analytical performances of a flow electrochemical sensor for preconcentration and stripping voltammetry of metal ions. Rihab Nasraoui, Didier Floner, and Florence Geneste. Journal of Electroanalytical Chemistry, 629, 30-34, 2009. Prussian Blue-modified microelectrodes for selective transduction in enzyme-based amperometric microbiosensors for in vivo neurochemical monitoring. P. Salazar, M. Martína, R. Roche, R.D. O’Neill, and J.L. González-Mora. Electrochimica Acta, 55, 6476-6484, 2010. Characterization of Hemoglobin Immobilized in MgAl-Layered Double Hydroxides by the Coprecipitation Method. Khaled Charradi, Claude Forano, Vanessa Prevot, Dominique Madern, Abdesslem Ben Haj Amara, and Christine Mousty. Langmuir, 26, 9997–10004, 2010.